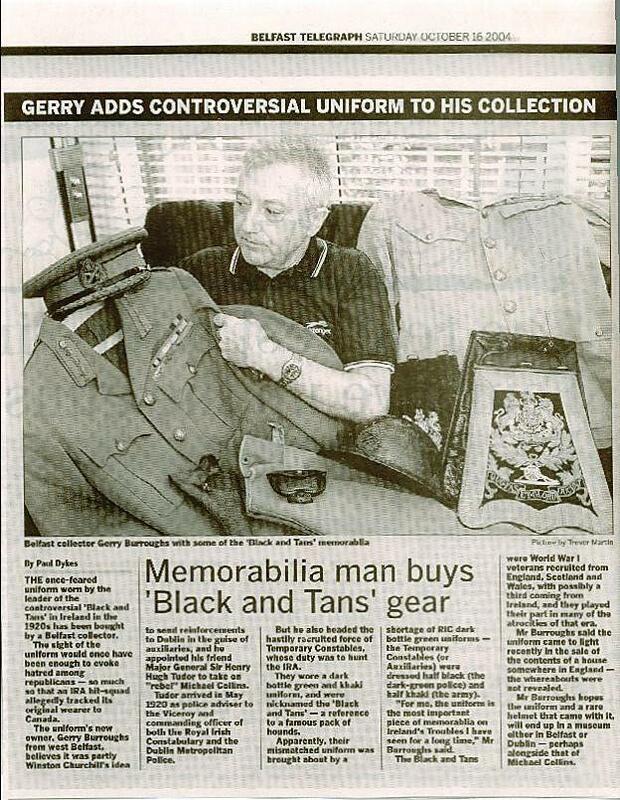 Interesting also to see that “holster” among the “Memorabilia” bought by Mr Gerry Burroughs. I have a photo of one, very similiar, which was owned by an Uncle who had been in the British Army but who also joined the Volunteers in Dublin 1918, after Demob. My Uncle’s is now held by Waterford County Museum, Dungarvan Co.Waterford. I am a friend of Mrs Carla Furlong,nee Emmerson of St John’s, NL who is Gaelic speaking and a harp teacher, trained at Juliard in NYC and in Montreal,QC. She was a personal friend of Lt. General Tudor and attended his funeral. Pallbearers were the Royal Newfoundland Regiment. They were part of the 5th Scottish Division that Tudor commanded in l918. Carla told me that General Tudor had a stroke and was bedridden from the war years till his death. The media recently reported that the IRA learned of Tudor’s home at 120 Military Road and came here to do the job in l950. However, they went to see Monsignor Joseph McDermot at the Basilica Parish in St John’s beforehand. He convinced them that with the RCMP coming to the province that year (NL joined Canada on April l, 1949), there would be no chance that they would escape. Tudor being bedridden for years when spinster-nurse, Monica McCarthy cared for him as his nurse and live-in girlfriend/housekeeper. Carla says that the General’s son came here once and was living in Hong Kong at that time. She corroborates that Tudor and Winston Churchill wrote frequently. I was l4 at the time of our joining Canada and had been an altar boy of Rev. Father Peter Sheehan who had served as a parish priest in Newfoundland for over 40 years. He was moved to my family’s parish of Holy Rosary in Portugal Cove, NL ( a few miles west of St John’s) in the autumn of l934. I was the first one he christened in the parish in December l934. Father Sheehan was clearly on the side of Germany (the friend of my enemy is my friend), and I recall that he preached not to join up during the War. In fact, only two persons did in the small Roman Catholic Irish enclave of ST Thomas in which I was born and raised and it five miles southwest of Portugal Cove, in Conception Bay, was part of Holy Rosary Parish from l833 to l982 when due to population growth, Holy Rosary was split to form two other ones and St Thomas went to Holy Family. Moreover, he preached Sunday sermons against Michael Collins and I think he said he won a medal jumping while in the seminary in Belgium during the early l920’s at an Olympics. He jumped for Belgium not Ireland because if he won the English anthem would be played. He no doubt, hated England with a passion and all of us, knew it. Father Sheehan was about 300 lbs in weight. He visited his home at l Military Road, Cork, NL in l933. He got into a road accident during the visit and was crippled during his pastorship at our parish. He had to wear rubbers during the hot days of summer, I recall. My father drove him since now he could not drive himself. He came to St Thomas once a month and stayed with the Lawlor family overnight as John lived next door to the Catholic school which doubled as a school and as a mission church. It was normally a visit on Wednesday. Amongst otehr things, Fr. Sheehan could drink whisky and I think he was a binge drinker; the chruch and schools fell into ruin under his stewrdship but Archbishop Roche did not rmove him. Father Sheehan returned to his home in Ireland in l950 and since he knew about Tudor who had a telphone listed in his name in the St John’s telephone directory, I am certain that Fr Sheehan contacted the IRA in Cork and advised them of General Tudor’s whereabouts. Fr. Sheehan would be eligible for a Canadian pension upon reaching 70 years of age at $40 a month due to the fact that he was here for 40 years and a British subject all deemed to be Canadians by law if living in NL in l949. So Sheehan ipso facto had Canadian citizenship by birth by Canadian Act of Parliament as I have. In l950, Archbishop Roche died and he was replaced by St John’s born, Archbishop Skinner but there was a co-adjudicting bishop O’Flynn with Roche as I recall. Archbishop Skinner was middle age and had been President of St Francis Xavier University in Antigonish, Nova Scotia before his elevation to Archbishop. He refused to allow Father Sheehan to return to Newfoundland or the Canadian government simply refused. I joined the RCAF from l953 to l956 and from 54 to 56, I served in Metz, and #2 Fighter Station,RCAF at Grostenquin, France near the German Border in northeaster France (Lorraine). During the month of November, l955, I was able to get a month of leave with permission to visit England and Ireland from my superior officers. I had no passport but I had a NATO Identification card issued by the RCAF in my name. It was ok in NATO counties but not officially in Ireland but myself and a guy Murphy, decided to take the ferry to Dublin from Hollyhead and after singing Kevin Barry for him on the dock, an Irish policeman allowed us into Ireland; we were in mufti at the time. Eventually, I took the train to Dublin and visited Fr. Sheehan at his home at l MIlitary Road, Dublin, Ireland. He was living with an elderly spinster sister and a young German refugee she had taken in during WW II. The refugee girl was about five or six years older than me and I was l9 years old at the time. Fatner Sheehan told me that he wanted to go back to NL but Skinner refused. He was an angry man and he died a few months afterwards. My former schoolmate, Fr John McGettigan, then at All Hollows, told me a few years ago before he retired, that he visited Father Sheehan shortly after I did and he corroborates that Fr. Sheehan was not permitted to return here. No doubt, it had something to do with General Tujdor’s near-visit by the two IRA assassins who came to NL. Of course, there was a large Orange society all across NL at that time and particuarly in Bonavista. Tudor came from Devon and over half of Newfoundlanders antecedants including me, have a connection with that county and with Dorset both of the West Country and due to fishing here. Tudor was a minister’s son who was a sub-Dean of Exexter Cathedral and initially all of Newfoundland was for the C of E congregation and Established Church here, under the Diocese of Exeter. Tudor might have relatives here. He married a Miss Edwards at Torquay, Devon, England in l903 but Carla says they did not get on.and that Monica loved him. None of his family attended his funeral here in l965. He was born in Newton-Abbot, Devon, England in December, l870. He is not listed on that villages page although it produced another general of the British Army as well. Teach an Sraidlabhradha Strathlaurie H.
Further to my previous corespondence, historically the officer class of the British Army were sons, usually third sons of the Gentry. Tudor was a vicar’s son, but his place of birth and his father’s Anglican parish of Newton-Abbey, Devon, England, was the site of one of many many English and Irish hiring fairs of the itinerant Nnewfoundland codfishery for 300 years and for West-Country merchants whose ships and crews crossed the Atlantic Ocean which under sail after taking on foodstuffs at Passage East, County Waterford, Ireland,every Spring for 3 centuries which normally one way was a six-week voyage. In Newfoundland then deemed in law to be a British Naval Ship moored in the Gulf of St Lawrence and not open to immigration beind de jure a military establishment. The cocfish was salted, later washed and sun and wind dried ashore in the merchants’ premises known in the trade as “Rooms.” The fish was brought home to England under sail by the late autumn ( 9 months away from home),culled and sold from centres like Bristol or Poole to foreign countries. At the time of the signing of The Treaty of Paris in 1783 which officially the United States of America as a sovereign country and a novel experiment of democracy by elected representation , the value to the Empire of the itinerant Newfoundland fishery equalled that of the accumulated, gross-national production of the former thirteen American colonies. Cumulatively, towns like Sturnminster-Marshall, eight miles up River Sturn from Newfoundland Houseat Poole, County Dorset, England, the birthplace of Strongbow (Richard de CLare) and many of my ancestors, employed annually up to 3,000 men just making sweaters(ganseys) used by the itinerants fishing annually in Newfoundland and thus, its creation of secondary industry in the mother country. The Bradley family had a large estate and mansion at Newton-Abbot or within walking distance of it. They were very successful fish merchants and later had businesses at Bonavista, Newfoundland. Maybe, on their frequent trips between Bonavista and Newton-Abbot, Devon, England, all of the Bradley family would know the General’s dad in his role of vicar. They might have been instrumental directlu or indirectly in his move here. Moreover, the Catholic herarchy, domiciled in St John’s. NL decided with the passing of The Quebec Act by the British Parliament in 1784, ensured that then British colony that the French language, the Roman Catholic Religionand their feudal system of seigneuries would continue and not ended till 1824. Inasmuch as the French Revolution of 1793 to use my father’s phrase, “gave the French too much democracy.” Mob rule was its result represented by the tri-color flag of red, white and blue. Even Christianity was outlawed and banned for two years following its success to overthrow ,imprison and behead is God-given, coronated with crism, king. There were few, if any, free thinkers in Newfoundland. As late as 1783, Michael Keating, of Harbour Main, Conception Bay, Newfoundland, had his fishing premises burnt to the ground by the Royal Navy because he permitted an itinerant Catholic priest to say mass for his Catholic dieters (fishermen) in one of his stores (fish sheds). He was fined 50 Imperial Pounds and exiled from the colony forthwith. In Newfoundland, the governor paid a bounty of 30 shillings to ayone delivering a dead or alive wolf or popish priest to the British authorities. Yet, thanks to changes in world events within a shot time, Catholic priests were brought under the rule of Bishop O’Donel who was a paid informer, and who,upon retirement was approved to receive a British-government pension, went from being hunted to unofficial agents of the British Empire. Gaelic was destroyed within one generation by the church and Irish- Newfoundlanders joined their island-domiciled Protestant brothers to bcome by 1914,according to Curchill, to be “more loyal than the king.” Mym first cousin thrice removed, Sir Edward Patrick (from January 1, 1918 – 1935, 1st Baron of SXt John’s, NL and Waterford, Ireland),Morris was from 1908 to Decembeer 31, 1917, a Catholic, Prime Minister of Newfoundland and a member of the War Council of the British Empire during World War 1. 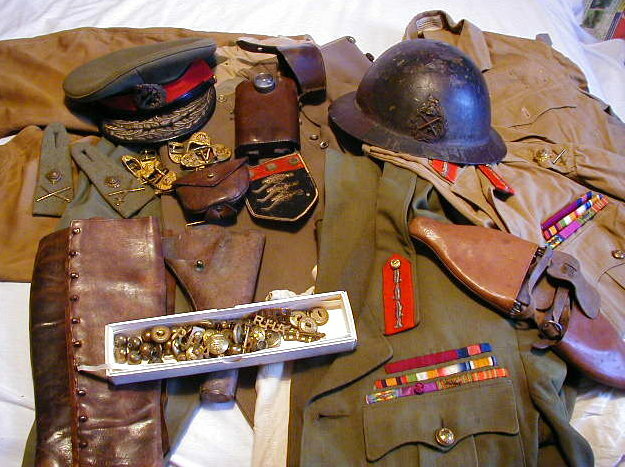 British generals including Tudor, were surprised of the numbers of Irish-Catholic volunteers in the Royal Newfoundland Regiment that it was the first regiment of the British Army since the Reformation, to be permitted to have a Roman Catholic priest in uniform as padre. Father Nangles who later quit the priesthood a decade after the war ended to marry and settle in Rhodesia, was promoted to Lieutenant Colonel in the Royal Newfoundland Regiment and for a decade after the War supervised Newfoundland’s efforts to create parks and cemeteries in France as evidenced there today. Maybe, Morris or he suggested to authorities that general Tudor might survive in Newfoundland. In passing, I report that Carla Furlong is now a spry 90 year-old Gaelic-speaking, Anglican, harp teacher. She learned to speak Gaelic with a group associated with Memorial University. Her father was a lawyer and her maiden name was “Emerson.” I knew that prior to Confederation Sir Edward Emerson was a member of the Commission of Government which from 1933 to 1949,ruled Newfoundland as a junta appointed by the British government leaving the St John’s City Council with Andy Carnell the only elected body in Newfoundland (Andy was an undertaker). Later, Sir Edward Emerson was appointed a Justice of the Supreme Court of Newfoudland. When I asked Carla if she were related to Sir Eward Emerson she replied:”Oh yes, he was father’s first cousin, but he was a Catholic Emerson.” I did not ask her why but we in the Irish Catholic enclave and especially on “Beal na Faolain” thnought he was qujite harsh and certainly not a Roman Catholic. Another obvious relative of Carla’s husband, Chief Justice Robert Furlong, retired from the Supreme Court here in the late seventies or eighties. He was never married, spoke with an Oxford accent though educated at St Bonaventure’s College,my alma mater too, and who was thoroughly disliked by most who knew him. He reportedly was knighted by a former pope, practiced Catholicism fervently but dated an English-born divorcee for years though they never co-habited but I think they were neighbors in a posh area of St John’s. Well into his eighties, he died when his house caught fire. None I knew, mourned his horrific death. I include the foregoing so that it is not lost to successive researchers who may follow my leads here. Thanh You! It was interesting to read your posts. A question about Rev. Sheehan. Was he the author of poems ( Rev. P.P. Sheehan ) that I have seen in some NFLD journals ? Edward Buckley Cork Brigade? Any info Volunteer Quigley, any info?